Sunday May 26th 1901 I was busy most of the forenoon. I had some little chickens hatching to look after. Mother & Ott were out and Mr & Mrs Moore came so they all stayed to supper, which we enjoyed having them so very much. Monday May 27th 1901 We washed and done the other work in the forenoon I went as far as home with Will when he went down to see about getting a man to take Earnests place as he does not feel able to work any longer. 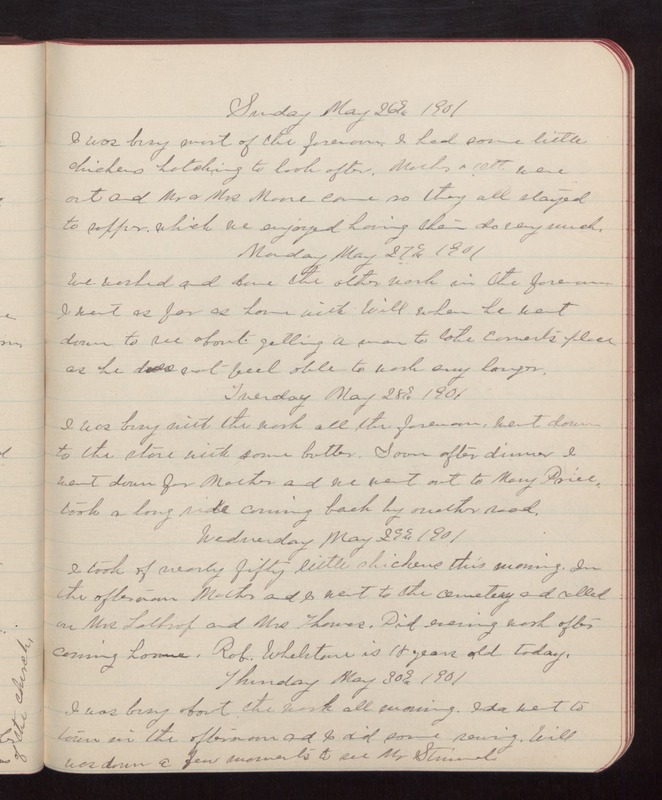 Tuesday May 28th 1901 I was busy with the work all the forenoon, went down to the store with some butter. Soon after dinner I went down for Mother and we went out to Mary Price. took a long ride coming back by another road. Wednesday May 29th 1901 I took of nearly fifty little chickens this morning. In the afternoon Mother and I went to the cemetery and called on Mrs Lathrop and Mrs Thomas. Did evening work after coming home. Rob. Whelstone is 18 years old today. Thursday May 30th 1901 I was busy about the work all morning. Ida went to town in the afternoon and I did some sewing. Will was down a few moments to see Mr Strimel.